W. J. T. Mitchell, the Gaylord Donnelley Distinguished Service Professor in English Language & Literature and Art History, is featured in the January 2011 issue of Chicago Magazine. 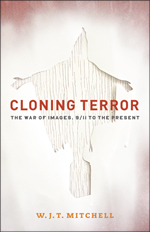 Mitchell is the author of the recently published Cloning Terror: The War of Images, 9/11 to the Present (University of Chicago, 2011), a book that explores how images have shaped public perception about the war on terror. Mitchell explains that images are among terrorists’ most powerful weapons. “The point of terrorism is always to attack the imagination by producing a spectacle and a sense of anxiety, panic, and fear,” he says. But iconic pictures such as the hooded man—and the art that they inspire—can also reveal the truth of our times. To read more about Mitchell’s exploration of wartime imagery and art in Chicago Magazine please click here, and to learn more about Cloning Terror please click here. Posted in Articles. Tagged with Art History, English Language & Literature, Faculty, Publications.